Quirky Jessi: Hogzilla is a Baby Compared to This! Hogzilla is a Baby Compared to This! A few weeks ago I posted about Hogzilla and a half ton of pork. I was quite amazed then, but this thing is just monstrous! This one is claiming to be 9 feet, 4 inches and weighs in at 1051 pounds!! 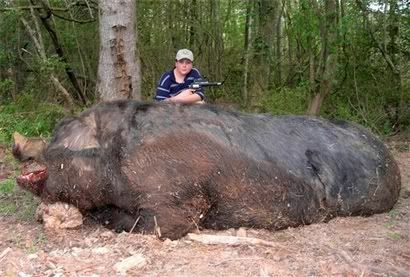 I'd be afraid to even get near a wild hog that size....it looks like a rhino and could eat me (even if it didn't want to) in one bite, lol!